BARBARA GEYEN SHERRILL, MUSIC EDUCATOR, PIANIST, ORGANIST, CHORAL DIRECTOR, COMPOSER, LYRICIST AND PLAYWRIGHT is a native of Galveston, Texas, who holds degrees from the California Institute of Arts (Bachelor of Music Degree, Piano), the University of Southern California (Teacher Credential) and California State University, Los Angeles (Master’s Degree). As a retired Music Educator, her teaching career spans over two decades with the Los Angeles Unified School District. 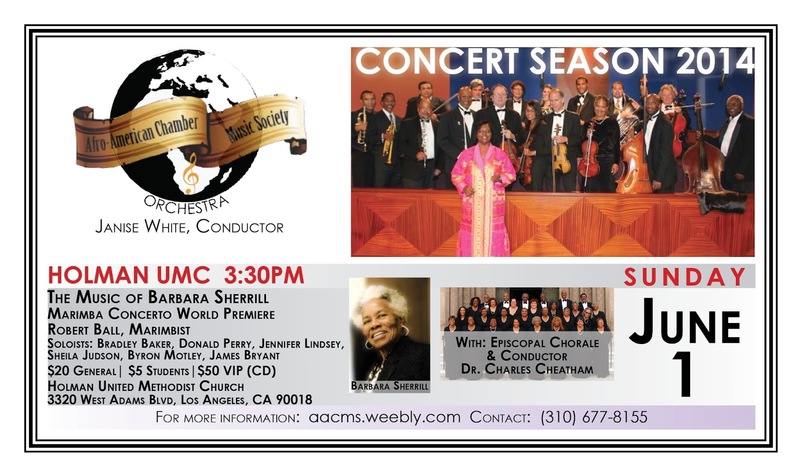 During her illustrious career, Sherrill conducted the Samuel Coleridge-Taylor Concerts, introducing the music of the Afro-British composer to Los Angeles audiences. As an innovator, she created Music in Black-The Classical Image! KPFK Radio Program and later organized the Heritage Singers which performed the choral music of African American composers. Sherrill is a distinguished composer of over 100 works ranging from large orchestral andchoral works to art songs, small instrumental ensemble and solo works. Her compositional output includes: 3 song cycles: Our Love, Seasons, Moods of My People, 2 musicals: But Weren’t There More, Love, Here I Am (I Am Thomas), 1989; Who Is That Man?, 1991 (Good Friday Cantata); A New Toy, 1992; (Children’s Cantata); Dig A Deep Pit. 1994 (Biblical Musical Drama); I’ll Go, 1997 (Christmas Cantata. commissioned by Ward A.M.E. Church); Introits and Amens, Volumes I & II; 2 marimba concertos for Robert Ball, art songs, hymn and spiritual arrangements for choir, voice, piano and chamber music. Four of her songs from the Song Cycle The Moods of My People: Daedus, Fly Away Home, Mae’s Rent Party and Club Woman received a major publication in 2004 in “A New Anthology of Art Songs by African American Composers” edited by Margaret R. Simmons and Jeanine F. Wagner. Sherrill is also listed in “Music by Black Women Composers: A Bibliography of Available Scores” by Helen Walker-Hill; “The African American Experience, From Spirituals to Symphonies African American Women Composers and Their Music” by Helen Walker Hill.